Hello! I'm so happy you decided to checkout our newsletter. The BeachHouse students have had a lot of fun building relationships on trips, in small group and at our gatherings. Growing in faith through the teachings of Gods word and responding through prayer, worship, & applying this wisdom and truth to their lives. Check out what we have been up to and how you can be a part of what God is doing at the BeachHouse. Whether you are an adult who wants to serve, or a student who wants to get involved, feel free contact me. To develop students of Character, Compassion, and Influence through a personal relationship with Jesus Christ. INVEST in the next generation of young people in significant ways. Riptide is the Wednesday night program at the BeachHouse for 7th- 12 graders. Riptide is an engaging night of food, hangout, games, message and small groups. Designed to develop students of Character, Compassion, and Influence, who make a lasting impact in their community and in the lives of those around them. Curious? Skeptical? Struggling? Riptide is a judgment free atmosphere where you can feel accepted and find your true Identity, Value, and Purpose. How do your dreams become a reality? This series looks at the life of Joseph, and the things he did to trust God to see his dreams come true. Week 1 - "A Life of Dreams"
For your dreams to come true, you must first dream. Week 2 - "A Life of Forgiveness"
To see your dreams come true, you must live a life of forgiveness. Week 3 - "A Life of Honesty"
To see your dreams come true, you must live a life of honesty. Week 4 - "A Life of Discipline"
To see your dreams come true, you must live a disciplined life. Week 5 - "A Life of Wisdom"
To see your dreams come true, you must live wisely. Week 6 - "A Life of Hard Work"
To see your dreams come true, you must work hard. Week 7 - "A Life of Humility"
To see your dreams come true, you must be humble. Dive is our Sunday morning student bible study 10:30 - 11:45 am @ the BeachHouse. Dive is a place where students enjoy fellowship, coffee bar, small groups, worship time, and go a little deeper into the word. Jesus is who he claimed to be? there is a plan for my life? The middle school boys won the last game night and chose to go play air soft. 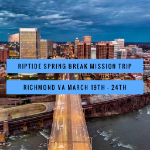 We will be partnering with Celebration Church and Outreach Ministry in RVA over spring break. Helping with their thrift stores, food pantry, feeding the homeless, sharing the love of Christ in communities, bus ministry, and much more. We will be staying at the church that has a fully functional cafe, fitness center, multiple showers, restrooms and sleeping areas. We will be attending student life camp @ South Eastern University. This is our summer camp for students entering 7th - 8th grade. Contact [email protected] for more info or to register. We will be attending student life camp @ Liberty university in Lynchburg VA. This is student lifes largest and most energetic summer camp with 1,200 students in attendance. Students entering 9th - 12th grade may attend. Contact [email protected] for more info or to register.